What are the two colors that you most associate with Christmas? Your answer is red and green, correct? When you hang Christmas lights on your house and on your Christmas tree, its likely that red and green are predominately displayed. Red and green certainly arent the only colors used to celebrate Christmas. But based upon centuries of tradition, they are the primary Christmas colors. These days, though, the word green has a new meaning—, a meaning that has little to do with a wavelength on the color spectrum. The new meaning of green has to do with protecting and preserving our home, Planet Earth. The new green is about doing what we can to minimize negative impacts upon the environment. Its about husbanding our use of natural resources in a responsible manner, balancing short-term benefits with long-term consequences. A perfect example of achieving that balance is through the use of a new kind of green Christmas light: light emitting diode bulbs or LEDs as they are commonly known. You might think of LED Christmas lights as the new Christmas green. Thats because they are far more energy efficient than the incandescent bulbs that have been the mainstay for more than a century. LEDs are more energy efficient because they generate light differently than incandescent bulbs. Incandescents generate light by running an electrical current through a filament, setting it aglow. LEDs generate light by using electricity to excite a diode, which then emits light. LED Bulbs are Long-Lasting. Because of the difference in the way LEDs generate light in comparison to incandescents, LED bulbs last much longer. LED bulbs are typically rated at anywhere from 25,000 to 75,000 hours of estimated lifespan. And thats actually an additional green benefit of LEDs, because youll go through many incandescent bulbs within the lifespan of a single LED bulb. That means you can eliminate the negative environmental impacts of the manufacturing, shipping, disposal, etc. of all the incandescent bulbs you would use in place of just one LED bulb. LED Bulbs are Cool. Way cool, in fact—but not only in the way youre thinking. LED bulbs are cool to the touch. Most of the energy wasted by incandescent bulbs is converted to heat. LOTS of heat—as you know if youve ever made the mistake of touching a lit incandescent bulb! But LEDs are cool to the touch, even after theyve been aglow for hours. This lack of heat offers two more side benefits; reduced fire risk and minimal drying out of your Christmas tree. LEDs Offer Brighter, Purer Colors. How do you get a red incandescent Christmas light? You cover the bulbs filament with a red-colored bulb to dye the color of the light. Thats how you get any color with an incandescent. But LED bulbs are different. Each bulb generates the true color of the bulb. Red bulbs generate red light on the color spectrum, for example; and blue bulbs generate blue light on the color spectrum, and so on. Does it really matter whether the color is dyed or real? Indeed, it does! Compare an LED and incandescent side-by-side, and youll see that the difference is rather striking. Time to Go All Green With Your Christmas Lighting? 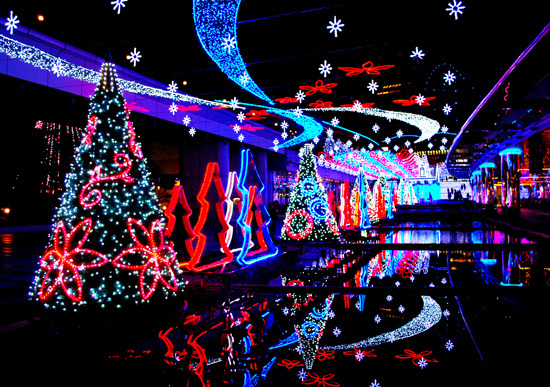 Why not give the environment a helping hand, and go all green with your Christmas lighting by switching to LEDs? This year your Christmas lights can consist of green greens, and green reds, and green blues, and... well, you get the idea. Youll save on energy costs, and youll enjoy the other benefits of LED lighting as well. And youll also be giving Mother Nature a really nice gift for Christmas. She deserves it, wouldnt you agree? Jason Woodward is Director of eCommerce for ChristmasDesigners.com, a leading supplier of both indoor and outdoor LED Christmas lights and decoration products. Christmas Designers caters to all Christmas enthusiasts, including private homeowners and professional installation contractors. You can also find Jason on Google+.